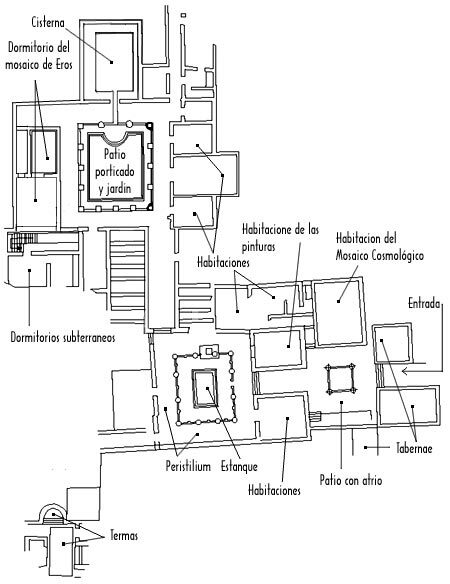 Domus of the Mitreo, at Merida, Badajoz. This room is endowed with three patios for distribution, illumination and ventilation. As we enter the house we find the first one: almost square with a central patio limited by four columns supporting its cover. It took waters to the inner part compluvium. There, a pool was also a tank for water impluvium. Through a corridor, we enter the second patio. It is endowed with a porticated rectangular peristylum and a central pool. From an corner, third patio can be reached. 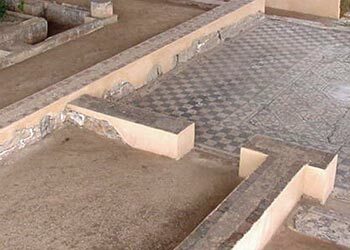 This new porticated patio has a viridarium, central garden and corridors decorated with mosaics. At the bottom there is a great vaulted room keeping a cistern where water taken from the patio was stored. 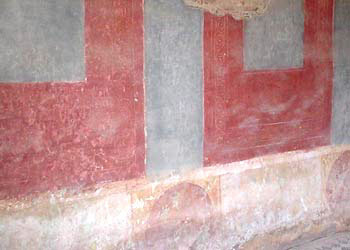 Through one of its sides, almost at its apex, a corridor gives place to a bedroom decorated with a geometric mosaic and a central figure od Eros, with two supplement rooms. From this corridor, close to the prior room, a staircase gives access to underground rooms, probably for resting at summer. As outstanding elements of the house we should point out to private termae. We preserve its caldarium -a room with warm water- and its baths. It is built with masonry with ashlars at the corners. It was built out of the wall, at one side of the Southern door where Kardo maximus is continued. It is close a legendary Sanctuary -that gives it its name- and a necropolis.